Goodreads: "I, Emma Freke, am not a freak. Or maybe I am. I just don't know." What's in a name? 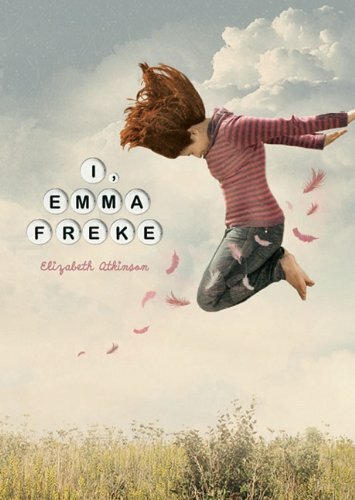 I, Emma Freke is a charming search-for-identity story about Emma - the only "normal" member of her quirky family. Her flighty, New Age mom seems to barely have time for a daughter, especially one who annoyingly spoils her mom's youthful facade. Emma's well-meaning grandpa is clueless. And her only friends are the local librarian and a precocious 10-year old adopted by the two ladies next door. Kritters Thoughts: A cute little MG read that I absolutely enjoyed. From reading about her very unusual home life to taking a trip to meet the entire extended family, this book was a great little read. Often, I don't read MG just because I don't think of myself as a great audience for it. But more often than not, I realize that I can still appreciate and remember the clicks in high school and the outsiders. Although, my family life was on the opposite spectrum of how Emma Freke grew up, it was great to read how one girl is completely affected by the ways of her mother and grandfather. When she visits with her extended family on her father's side, I loved how the flip got switched and she fit in and felt a part of a clan. As far as what sometimes turns me off to YA - is the characters. At times I can relate, but sometimes I just find the characters to be too whiny or not really depicted as the age that they are really. SO if I haven't thoroughly confused you with my random thoughts - I loved these characters, believable and great to read. A book that I would pass on to both my older and younger readers for very different reasons. Both groups would enjoy this cute little read at any time of the year.